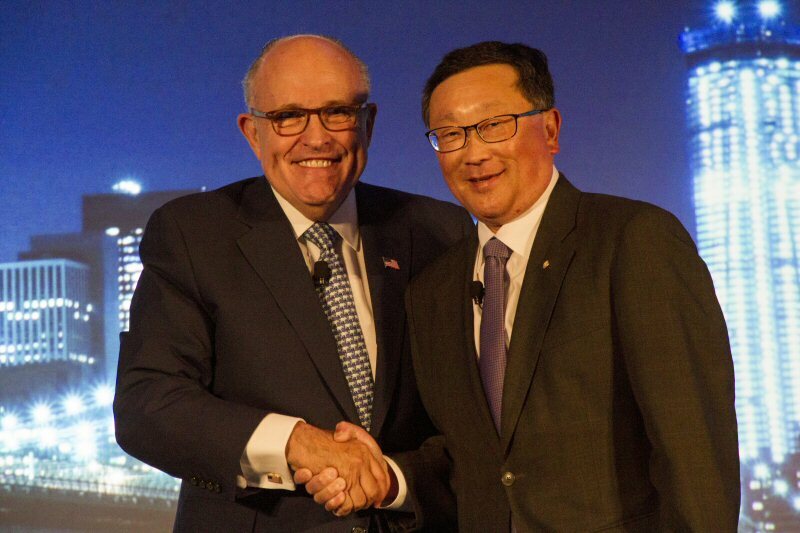 Rudy Giuliani, former New York City Mayor, joined BlackBerry CEO John Chen at the company's annual Security Summit to discuss the state of security in an increasingly mobile-driven world. The prevalence of cybercrime is increasing exponentially and threatens both the reputation as well as the financial and economic stability of people, corporations and governments globally. At the Security Summit, Giuliani reinforced the need to create solutions that combat the growing number of cyber threats emerging around the world, and how these threats are impacting commercial and national security globally. Giuliani also spoke to the continued importance BlackBerry will have in the security of global information and communications systems as the company's solutions offer the world the opportunity to surround cyber threat problems. He recalled his experience with 9/11, and the role BlackBerry played to keep people connected in a time of crisis, saving lives and enabling him to restore command centers to manage the crisis and how this influenced his mission to keep people safe as we move into an increasingly digital and interconnected world.